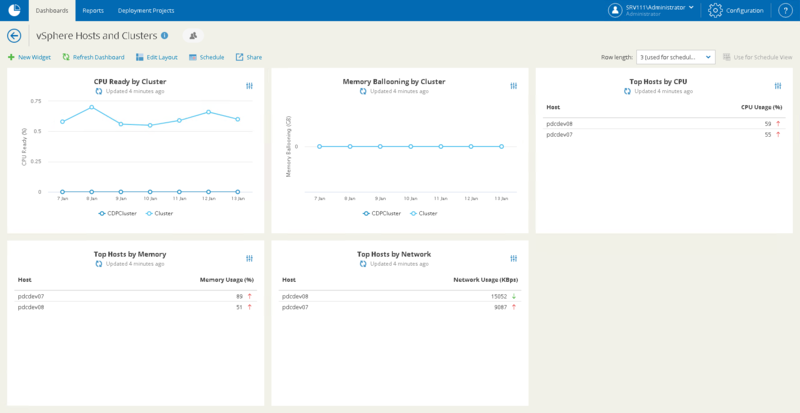 The VMware Hosts and Clusters dashboard helps you evaluate host and cluster performance in your VMware vSphere infrastructure. The dashboard displays statistics on CPU, memory and network utilization, and helps you identify hosts and clusters with performance issues. This widget shows how the average CPU ready time for all VMs on all hosts in the cluster has been changing during the week. This widget shows how the amount of memory processed by the VM memory control driver for all VMs on all hosts in the cluster has been changing during the week. Arrows on the right show how the average CPU usage value has changed over the previous week*. Arrows on the right show how the average memory usage value has changed over the previous week*. Arrows on the right show how the average network throughput value has changed over the previous week*.